Rob Sheffield's bestselling 2007 Love Is a Mix Tape was his farewell song to his adored wife Renee Crist, dead of an embolism in under a minute in May 1997 with her helpless husband calling 911 at her side. They were both 31. It's one of the few books I've ever read while crying, and although in late 2006 Sheffield remarried, I figured it wasn't so much wise as sane for him to sidestep that complex event and instead follow up with Talking to Girls About Duran Duran, a musical prequel that takes place in the '80s. But now it appears that that wasn't sanity, it was patience, something he's good at. Turn Around Bright Eyes is a fond and funny reflection on his second marriage--not a happy ending, because nothing's ended, but a work in progress. Sheffield has been a Rolling Stone reviewer and culture columnist for over a decade now, and what's doubly remarkable about both marriage memoirs is that they're also rock criticism. Love Is a Mix Tape chronicles indie-rock, the music he and Renee were so passionate about they kept making each other the mixtapes that keynote each chapter. Turn Around Bright Eyes celebrates a musical form that has obsessed both Sheffield and his wife Ally for the entire decade or so they've been together: karaoke. We'll get to karaoke, I promise. But karaoke is not why people should read this book. No doubt too-much-information sophisticates will think, and perhaps write, "Your wife died in your arms. That's a genuine trauma--you're excused on that one. But don't let it go to your head. Now you say you love her replacement just as much? Have you no decency, sir?" Which is baloney. Sheffield has a great theme here. He thought his life had come to an end, and for years it did as his career blossomed. That he passed through this denouement to find love again on the other side neither diminishes the trauma nor merits a sophisticated yawn. It's a miracle of luck and struggle we should be glad and impressed he has the stuff to put into words--tender, grateful, thoughtful, self-mocking, sane, wise words. As Sheffield knows full well, his first marriage was a bumbling novice's, his second a bumbling veteran's. But though the gain in maturity plus the trauma in between is certainly one reason the two are different, the main one is that the women are different. This isn't necessarily what you'd expect--maybe he's one of those guys who has a type. But he isn't. And this male human who believes he's a better husband than boyfriend found he could love each of these female human beings deeply, unreservedly, and for herself alone. I can't speak to what these two different women have in common, although I bet there's more information there than Sheffield chooses to divulge--decency is not his problem. But for sure there's one thing. Both loved and love music with a passion pretty much equal to his own. So of course a guy who learned to love Duran Duran by talking to girls is now discovering unsuspected dimensions in the goth-pop Ally loves. More unexpected are the well-woven remains of a misfired rock fantasy camp feature and some dazzling explication de texte on the romantic sensitivity of "She Loves You" that leads to the reasonable conclusion: "John and Paul formed new bands with their wives, and made records where they invited their wives to sing. No other rock stars ever made such a big deal about loving their wives." Which brings us, yes it does, to karaoke. Rob and and his astrophysicist honey love karaoke. They go out singing every chance they get. Me, I have no interest in karaoke, but also nothing against it. As musical democracy it definitely has something going--among other things, a collectively created alternative version of pop. And insofar as karaoke is the kingdom of schlock I can get with--"Don't Stop Believin'," "Livin' on a Prayer," lesser Rod Stewart, and Bonnie Tyler's "Total Eclipse of the Heart"--it's fun to read about. So I found most of the sizable chunks devoted to Sheffield's thoughts on this democracy engaging as both history and criticism. 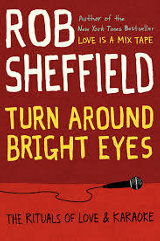 But toward the end Sheffield devotes a full chapter apiece to what I guess he considers the reigning triumvirate: Neil Diamond, Rush, and David Bowie--Bowie the horrible singer as opposed to Bowie the shape shifter who kept it interesting till Let's Dance. Not only was I unconvinced of their majesty, I found myself uninterested--even, occasionally, nauseous. I would much rather have learned something about, say, Ally's cooking. Or, more likely, Rob's.